Click HERE for more information on a specific topic. 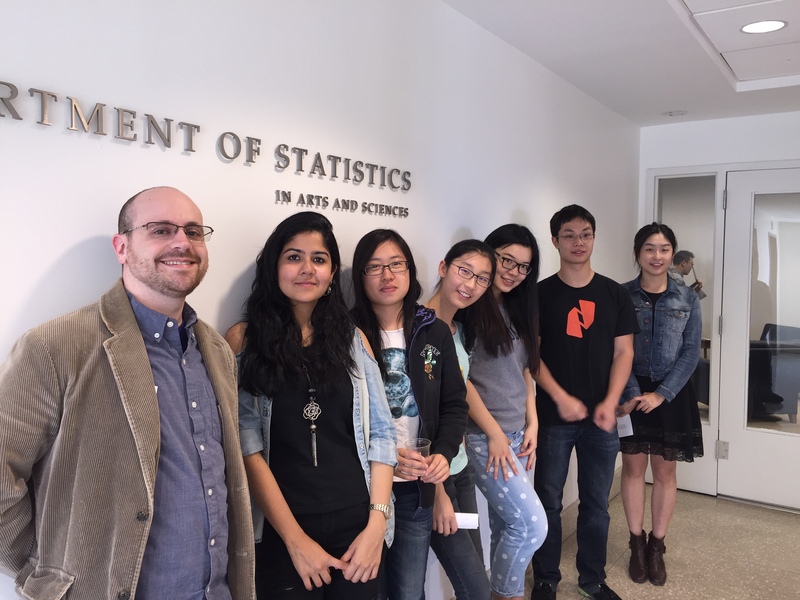 Congratulations and welcome to the Department of Statistics! Follow the requirements provided in the lists above to avoid delays in registration or potential penalties. Note that pre-registration for new students will occur in late August. After you register for classes and the appropriate RU (residence unit), you will be charged tuition and fees. Please read about this HERE. If official proof of student enrollment or graduation is required by an employer or another entity, please visit the Office of the University Registrar. Current matriculated students can request enrollment certification via SSOL . For academic certification, an official document provided by the University Registrar verifying your dates of attendance, award of degree, and/or student status (full-time or part-time) by semester, please visit the Office of the University Registrar: Certifications . During the semester there are important dates to remember including the LAST DAY to DROP COURSES and the LAST DAY for R Grade & PASS/FAIL. The deadlines for half- semester courses are different. GSAS policy for dropping half-semester courses is that it must be dropped within the first two weeks, as this is in proportion to the drop deadline for full-semester courses. The deadline to take a half-semester course for Pass/Fail or for R credit is the first day of the fifth week of the course. Rules and deadlines regarding grading and required courses/electives are strictly followed. Only students with a G.P.A. of 3.0 or above can graduate from the MA Program. Please read the GSAS website. University-owned housing is very limited and most MA students do not receive housing. To apply for University housing, follow the directions at University Apartment Housing (UAH). Information about types of housing, leases, and location of University housing is available on the UAH website. Please note, incoming master’s students who are granted housing are normally limited to one year of housing and must be enrolled full time in both semesters Student should also take advantage of Columbia’s Off-Campus Housing Assistance (OCHA)Office which provides assistance in renting housing in New York City as well as a bulletin board on which you can search for prospective roommates who are Columbia students. This is a great resource for MA students as even those that do get housing typically must seek off campus housing for the final semester. Please note that you should reach out to OCHA at least a few weeks before you need your housing. For further information, please refer to the GSAS Student Housing website. Columbia University has established email as an official means of communication with students. An official Columbia University email address is required for all students. The University has the right to send official communications to the University email address, which is based upon the University Network ID (UNI) assigned to the student. The University expects that every student will receive email at his or her Columbia University email address and will read email on a frequent and consistent basis. A student’s failure to receive and read University communications in a timely manner does not absolve that student from knowing and complying with the content of such communications. Students may elect to redirect (auto-forward) email sent to their University email address. Students who redirect email from their official University email address to another address do so at their own risk. If email is lost as a result of forwarding, it does not absolve the student from the responsibilities associated with communications sent to their official University email address. Email use must be consistent with other Columbia University policies including the Email Usage Policy. Learn more. The International Students and Scholars Office is the top resource in terms of all visa issues. The ISSO office has walk-in advisory hours all week and is located at 524 Riverside Drive between W. 122 St. and Tiemann Place. Information on how to invite family and friends for Graduation or for other events is HERE . Student Employment information can be found HERE. The MA Statistics Program offers OPT, but does not offer CPT. General information on OPT can be found HERE on the ISSO Website. Current MA Statistics students can find out how to receive Department Approval as the first step in their formal application for OPT by reading the weekly MA Statistics Newsletter. More information about OPT and Pre-OPT may be found on this PAGE. Current students may review information HERE. Details on the OPT extension for students with STEM degrees can be found HERE . The ISSO calendar can be found HERE . ALP – American Language Program – This program is highly recommended for MA Statistics students, especially those who will be seeking employment in the U.S. Besides technical abilities, employers look for candidates with excellent communication skills. The following three courses are available to all Columbia University students. Students who register for one full Residence Unit (1RU) or one full Extended Residence Unit (1 ER) will not have to pay tuition for a course as long as the total points taken in one semester do not exceed 20. Expect to pay nominal out-of-pocket activities/materials fees, however. Please indicate that you are an M.A. Statistics student. Mr. Chaffee will assign an online placement test for you. More details on the American Language Program can be found here . Information on the Chazen English program at the Columbia Business School can be found here . Available to MA Statistics students. This is a free service that is extremely helpful for anyone preparing written career materials or academic writing. Excellent written communication is critical for your success in the job search. This service will not provide career advice, but will check grammar and content. Find details here . HERE is a listing of institutions in New York City which offer English language instruction and conversation. Call or email for details. Share your feedback with the Department by writing: maprogram@stat.columbia.edu.